M y family has been in New Mexico and Colorado for a very long time. 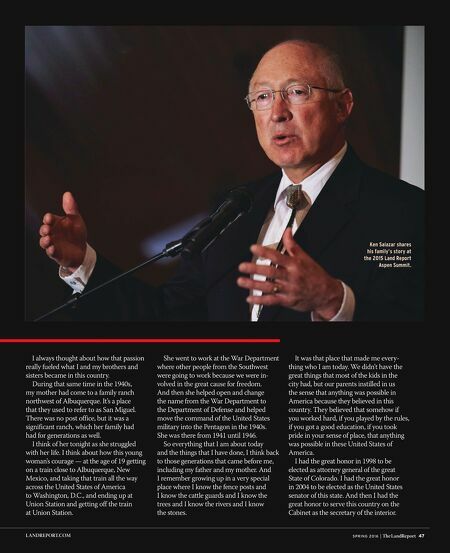 Oftentimes when I was introduced by the President, he would say that in my case it wasn't that we came over the border into the United States of America, but the border really had come over us. And that's because my family has been part of New Mexico and Colorado now for over four centuries. My great-grandfather and grandmother 12 generations ago founded the city of Holy Faith, the city now known as Santa Fe, New Mexico, more than four centuries ago. So for four centuries, they lived off the land. They made a living off ranching and farming on the banks of the Rio Grande River moving north, and then, after the Mexican- American War and the Treaty of Guadalupe Hidalgo, moving into what is now the San Luis Valley and being a part of the same farm and the same ranch that we have had in our family for a very long time. 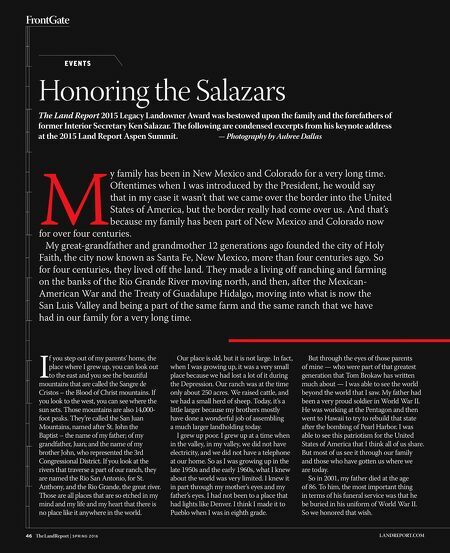 46 The LandReport | S P R I N G 2 0 1 6 LANDREPORT.COM FrontGate Honoring the Salazars The Land Report 2015 Legacy Landowner Award was bestowed upon the family and the forefathers of former Interior Secretary Ken Salazar. The following are condensed excerpts from his keynote address at the 2015 Land Report Aspen Summit. — Photography by Aubree Dallas E V E N T S I f you step out of my parents' home, the place where I grew up, you can look out to the east and you see the beautiful mountains that are called the Sangre de Cristos – the Blood of Christ mountains. If you look to the west, you can see where the sun sets. Those mountains are also 14,000- foot peaks. They're called the San Juan Mountains, named after St. John the Baptist – the name of my father; of my grandfather, Juan; and the name of my brother John, who represented the 3rd Congressional District. If you look at the rivers that traverse a part of our ranch, they are named the Rio San Antonio, for St. Anthony, and the Rio Grande, the great river. Those are all places that are so etched in my mind and my life and my heart that there is no place like it anywhere in the world. Our place is old, but it is not large. In fact, when I was growing up, it was a very small place because we had lost a lot of it during the Depression. Our ranch was at the time only about 250 acres. We raised cattle, and we had a small herd of sheep. Today, it's a little larger because my brothers mostly have done a wonderful job of assembling a much larger landholding today. I grew up poor. I grew up at a time when in the valley, in my valley, we did not have electricity, and we did not have a telephone at our home. So as I was growing up in the late 1950s and the early 1960s, what I knew about the world was very limited. I knew it in part through my mother's eyes and my father's eyes. I had not been to a place that had lights like Denver. I think I made it to Pueblo when I was in eighth grade. But through the eyes of those parents of mine — who were part of that greatest generation that Tom Brokaw has written much about — I was able to see the world beyond the world that I saw. My father had been a very proud soldier in World War II. He was working at the Pentagon and then went to Hawaii to try to rebuild that state after the bombing of Pearl Harbor. I was able to see this patriotism for the United States of America that I think all of us share. But most of us see it through our family and those who have gotten us where we are today. So in 2001, my father died at the age of 86. To him, the most important thing in terms of his funeral service was that he be buried in his uniform of World War II. So we honored that wish.